This paper aims at understanding how Zambia's electricity system would be affected by droughts (due to a dry year) and how the system's adaptive capacity could be improved. Hydropower currently supplies 99% of the total electricity in Zambia, and concerns have been raised because many climate change studies project increased occurrences of dry years in the Southern Africa region. Different economic and climatic scenarios were explored to understand their impact on the development of Zambia's power generation system, and what policies and strategies could be adopted to mitigate these impacts on security of supply and average generation costs, which directly affect the electricity price. 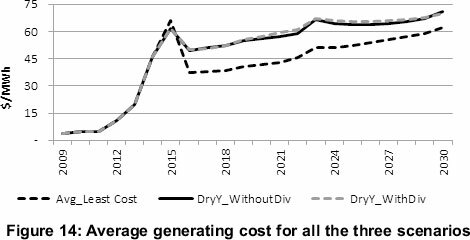 The results show that a dry year has significant impact on the average generating cost since hydropower continues to dominate the system. Diversifying the system does not improve the adaptive capacity of the system but only increases the average cost of generating electricity in an average year. 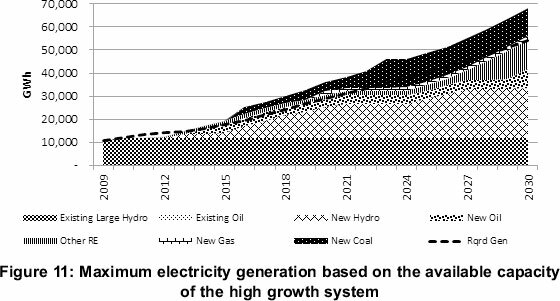 The most cost effective way of increasing the system's adaptive capacity is by importing electricity and gradually increasing share of renewable and coal technologies in the system. Further research on how electricity trade in Southern Africa could be enhanced, should be done. Electricity demand in Zambia has been increasing and the trend is expected to continue. This can mainly be attributed to the increase in economic activities the country is experiencing, especially in the industrial sector. The increase in economic activities is in line with Zambia's hope of achieving middle income industrialised country status by 2030. There still remain significant challenges to achieving this aim, such as limited electricity infrastructure to support economic development and low levels of access to safe and clean energy for the majority of the population. Zambia's population in 2010 was about 13.1 million people, with 40% living in urban areas and the rest in rural areas (CSO 2011). The national electrification rate in 2008 was 22%, with only 3.2% of the rural population having access to electricity (ERB 2008). Since the 1970s, there has been limited infrastructure development in the electricity supply system. The need to expand the supply system was delayed because of reduced electricity demand from the industrial sector. 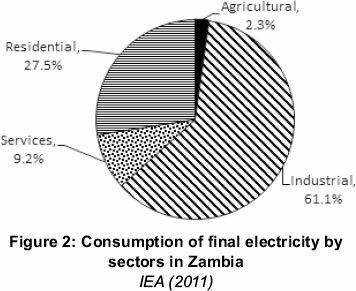 The industrial sector, mining & quarry sub-sector in particular, has historically been the main driver for electricity demand in Zambia. In the 1970s, demand for copper drastically reduced, in turn, the need for electricity by the sector was reduced (IMF 2008). The decline in global copper demand had significant impact on Zambia's economy which was and still is dependent on the copper industry. Zambia declined from a middle income country (in the 1970s) into a low income country (2000s). Despite these historical fluctuations in the economy, Zambia hopes to take a strong and dynamic path to develop a diversified economy by 2030 (GRZ 2006). In 2008, per capita annual income purchasing power parity (ppp) was $1278 (2005 constant international dollar price ppp), with a GDP of $15.82 billion (World Bank, 2011). The economy needs to grow at an annual rate of 9.14% in order to achieve the middle income industrialised status by 2030. However, as mentioned earlier, there still remain significant challenges. Recognising the role that electricity plays in economic development, Zambia has commissioned the construction of four hydro plants. These plants are Itezhi Tezhi, Kafue Gorge Lower, Kariba North Bank Extension and Kabompo. The other power projects earmarked for future development are Maamba Coal, Batoka Gorge, Devil's Gorge, Kalungwishi and some other smaller hydro plants (GRZ, 2011). However, considering that currently over 99% of electricity comes from hydropower and that all the projects being developed are hydro plants, makes Zambia's electricity system vulnerable to droughts. Droughts lead to reduction in runoff water which is needed for electricity generation, reduction in run-off directly impacts on the hydroplant availability. The impacts of a drought can be devastating, as was the case during the 1991/2 drought, where Zambia incurred a loss of about US$300 million (Kandji et al., 2006). Similar impacts were recently observed in East African countries (GNESD, 2009). In addition, occurrences and frequencies of a dry year in Southern Africa are expected to increase, which would further compromise hydropower dominated systems (Harrison, 2001; Harrison & Whittington, 2002; Tadross, et al., 2005; Yamba et al,. 2011). There is a need to understand how Zambia's electricity system would perform in dry years and also how the system can be enhanced to minimise the impacts of droughts. This is essential for improving the country's energy security. 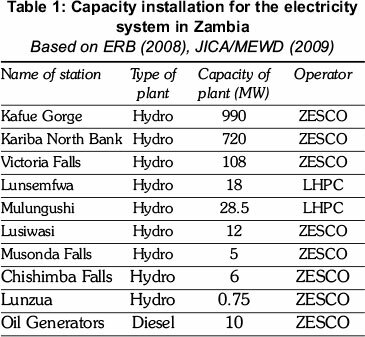 Zambia's electricity system is dominated by hydropower plants. Of the 1 899 MW installed capacity in 2010, hydro plants account for 1 889 MW while the remainder is off-grid oil generators. Furthermore, hydropower provides almost all the electricity supply, since the operations of oil generators is intermittent due to high operation costs. Table 1 shows capacity installation. Total energy consumption in 2008 was 245.25 PJ; and electricity accounted for 11% (IEA 2011). 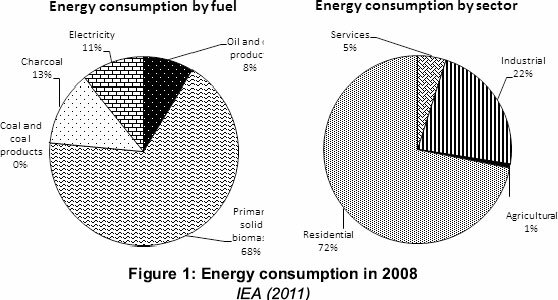 Wood fuel and charcoal (traditional fuels) accounted for the largest share of energy consumption as shown in Figure 1. The residential sector consumed 85% of the traditional fuels. Electricity is essential for economic development. Therefore, as Zambia's economic activities increase, there would be increased electricity demand. With diverse energy resource options, care has to be taken when developing the electricity supply system. Electricity expansion planning is a systematic and deliberate process of bringing together information of energy supply and demand with their related issues, so that a comprehensive energy system can be developed. O'Brien & Hope, (2010: 7550) observe that 'energy systems are a product of many interacting forces including socio-economic factors, resource availability and constraints, technological capacity and political aspirations'. Thus, due to the complex interactions between energy systems and these forces, demand and supply of energy has to be analysed simultaneously so that a balanced system can be developed. In addition to meeting energy demand, supply options have to be financially viable, and both environmentally and socially acceptable. Therefore, to ensure that all critical aspects of an energy system are captured, and a balance between conflicting objectives (economic, environment and social) are achieved, all stakeholders have to be involved. All supply technologies have their strengths and weaknesses. For instance, fossil-fuel based technologies cause air pollution and emits greenhouse gases (GHGs), while most renewable technologies require large land space. Renewable technologies such as hydro plants are vulnerable to climatic changes while solar and wind technologies require high capital investment and supply from these technologies is intermittent. Being a hydro-dominated system, Zambia's electricity system has to be diversified to reduce its vulnerability to climatic changes. Notwithstanding considerable untapped hydro potential (over 4 000 MW), the share of non-hydro technologies has to be increased in the future system. In order to develop a cost effective, robust and flexible electricity system, a number of factors have to be considered. These factors, among others, include the knowledge of demand and its shape; desired reliability; and economic, technical, sustain-ability, and human resources constraints (Munasinghe, 1981; IAEA, 1984; Makarov & Moharari, 1999; Ramana & Kumar, 2009; Choi et al., 2009; Nicholson, et al., 2011). Knowledge of these factors will enable a nation to develop institutional frameworks and policies that are necessary to develop a reliable electricity system. A reliable electricity system would further encourage sustainable development. Between 2000 and 2006, electricity demand in Zambia grew at an annual average rate of 6%. This was largely influenced by the increase in demand from the industrial (especially the mining & quarry sub-sector) and residential sectors. For detailed description of the sectors, see Tembo (2012). The rehabilitation work in the 2000s and growing demand caused Zambia to reduce her exports and increase her imports of electricity. However, the imports were not able to cover the shortfalls, thus, the supply of electricity was characterised by massive load shedding. Nonetheless, these load shedding events did not affect the mining and quarry sub-sector due to contractual supply agreements (IMF, 2008; World Bank, 2008); the residential sector was the most affected. Electricity consumption by sector is shown in Figure 2.
and services sectors. The country generally experiences moderate temperatures between January and May. Increased processing and mining activities in the agricultural sector and mining & quarry sub-sector respectively over time. 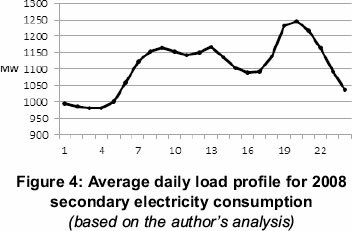 An average daily load profile (as shown in Figure 4) of electricity was divided into four parts, to capture the peaks in the morning, lunch and evening times in the model. Studies by Tadross et al., (2005) project that climate in Southern Africa will change. The study show that temperature and total summer rainfall will reduce. Further, the patterns of rainfall will also change; there will be increased rainfall in October-December and reduced rainfall in January-March. These projections are above 90% confidence levels. This study is consistent with studies by Ragab & Prudhomme (2002), Harrison & Whittington (2002) and Arnell (2004). Though there remains uncertainty by how much climate will change in the region, there is no doubt about what direction this would be: a drier and hotter region. Being an inland Southern African country, Zambia's mean temperature is expected to increase by 3-5 °C by 2070 (Tadross et al., 2005; Mukheibir 2007). This would lead to an increase in evaporation from the rivers and lakes, which in turn, could affect the production of hydropower from these water bodies. Furthermore, Arnell (2004) urges that with or without climate change, water stress in Southern Africa is projected to increase. Therefore, planning of an energy system that is hydropower dominated has to be carefully thought through. There are four major ways in which climate change can affect hydropower projects as summarised by Mukheibir (2007): increased evaporation, reduced run-off due to droughts, increased run-off due to floods, and siltation. This study relied primarily on published public domain documents. Data was collected from the Government of the Republic of Zambia (GRZ), Energy Regulation Board of Zambia (ERB), Bank of Zambia (BoZ), ZESCO, Southern Africa Power Pool (SAPP), World Bank and project based technical reports such as DHEC (2011). The study covered a period of 22 years, from 2008 (base year) to 2030 (end year). Electricity demand projections were done using an end-user method, while a least cost supply model was developed for the period 2009 to 2030. There are three main modelling frameworks: simulation, accounting, and optimisation frameworks (Alfstad 2005; Giatrakos et al., 2009). Depending on the purpose of the model to be built, a particular framework could be used. Below is a description of each of these model frameworks. A simulation framework describes the behaviour of the system. This enables the user/modeller to have a deeper understanding of how altering a variable (such as policy instrument) would affect the behaviour of the other system characteristics (such as energy consumption patterns). Accounting frameworks, which are a particular form of simulation framework, gives the user/modeller a specific outcome based on the input assumption and data. Optimisation frameworks on the other hand, are prescriptive tools. These tools prescribe to the user/modeller what needs to be done to achieve the target, based on the set objective within the given options and constraints. The demand projections were done using Longrange Energy Alternative Planning system (LEAP). LEAP was chosen because of its adequacy to model the demand side of the Zambian system given the problem at hand, the time and the data available. This approach makes it easy to identify improvement opportunities as all the technology details can be explicitly considered. Finally, the end-use method doesn't heavily depend on historical data, thus creating a baseline can be done easily. Below is the general end-use equation, expressing energy required as a function of activity multiplied by energy intensity of the activity. A is the activity demanding energy (such as number of electrified households, floor space, GDP output and industrial output), and E is the electricity intensity. ε is the elasticity between electricity intensity (kWh/HH) and income (GDP/HH) in this case and was estimated using average (1980 - 1989) values of income and consumption in South Africa. It was assumed that as income increases, more households were transiting from using traditional fuels to more convenient forms of energy such as electricity (Mdluli 2007; Howells 2008). Also, other already connected households tended to increase the utilisation of electricity thus, increasing the intensity per household. It was also assumed that the elasticity ( ) followed the path of South Africa, since it was calculated based on the World Bank dataset of Energy Intensity per capita versus GDP per capita of South Africa. South Africa data was used for three main reasons, firstly, because South Africa and Zambia are in the same region (Southern Africa). Secondly, they are both mineral rich countries, and lastly, the data was available. The elasticity was calculated based on the US$ Purchasing Power Parity (ppp) 2005 constant price. This made the comparison of the two countries much easier. Zambia's population of 13 088 750 (World Populations Prospects, 2012) is expected to grow at an annual rate of 3.15%. This growth rate is an average of High fertility and Low fertility population scenario projections, which also take effects of HIV/AIDS into account (MFNP 2010). The HH size of 5.2 (CSO 2005) was assumed to remain the same throughout the analysis period. The urbanisation trend is expected to continue, and by 2030, 49.6% of the population would have settled in urban areas from 2008's 39% (CSO, 2011). 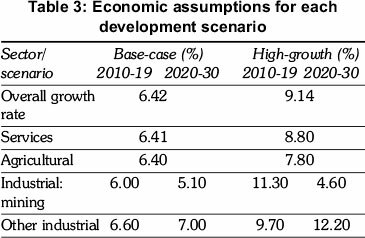 By 2030, national electrification rate of 66% would be achieved under High Growth economic scenario (GRZ, 2009), while only 34% would be achieved under Base-case economic scenario. The projection for the economic sectors was done by multiplying energy intensity (which was calculated as kWh/US$) and GDP (in US$) contributed by the respective sector. The intensity calculations were an average of 2008 and 2009, and the GDP projection was based on the economic growth projection as described in the section to follow. It was further assumed that intensity does not change throughout the analysis period. Table 2 shows the historical contribution of each sector to GDP and electricity demand. It also includes the electricity intensities of all the sectors. Two economic scenarios were developed: Basecase and High Growth. Base-case scenario assumes that Zambia's economic structure remains the same at that of 2010 and that the annual growth rate in all sectors grows at a lower rate. Growth in the mining & quarry sub-sector is limited because of lack of supporting infrastructure. The economy between 2011 and 2030 grows at an annual growth rate of 6.42%, which is the average of 2006 - 2010 period. The High Growth scenario is more optimistic. This scenario represents a preferred development path which leads to Zambia becoming a middle income industrialised country by 2030 as described in Vision 2030 (GRZ, 2006). All sectors (agricultural, services and industrial) grow, but the most significant contributor of the growth is the industrial sector, driven mainly by the growth in the mining & quarry sub-sector. The scenario assumes that there is consistent increase in the demand for copper and other mining products, and that Zambia keeps expanding her industrial activities to meet the demand. The GDP growth rate of 9.14% is assumed from 2011 to 2030. Table 3 is a summary all the economic assumptions. Model for Energy Supply Strategy Alternatives and their General Environmental Impacts (MESSAGE) was used to model the supply system. The demand projections from the LEAP model and the techno-economic data were integrated into the MESSAGE platform to characterise the electricity system. A Levelised Cost of Electricity (LCoE) analysis was also done to compare supply technologies' cost effectiveness. 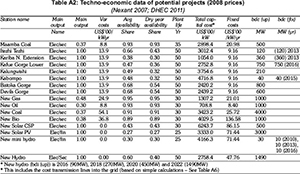 The techno-economic data of the existing plants and possible projects is included in the Appendices, Tables A1 and A2. A real discount rate of 10%. Reserve margin was set at 15%. RE technologies' investment cost was reducing over time to capture the learning effects associated with increasing global capacity of the new technologies. The optimistic mini-hydro and bio technologies reduction in investment cost was 5% for both technologies (RSA, 2011) and followed the log-linear function as modelled by Nemet (2006). 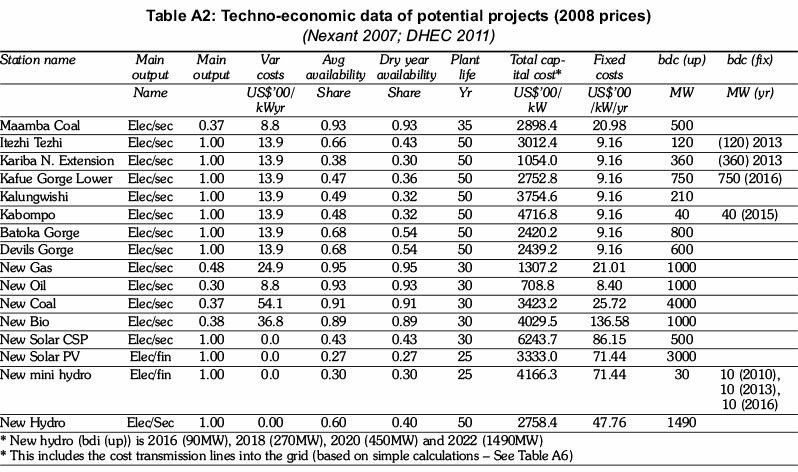 The reduction in investment cost for both solar PV and CSP was modelled based on IEA (2008). The pessimistic learning rate was 40% of the optimistic. The future cost of imported electricity followed the path as projected in RSA (2011), while the fossil fuel price takes the Current Policy path as in World Energy Outlook (IEA 2010). Only residential, services, and agricultural sectors have varying load profiles and curves, while for the industrial sector, were kept constant going with the assumption that the activities in the industrial sector do not vary throughout the day. The transmission and overall distribution losses in 2009 were assumed to be 3.5% and 20.74% respectively (IPA, 2007). The distribution line losses into the Industrial sector were assumed to by 3.5% and it remained constant throughout the analysis period. The cost of distribution losses (i.e. $/kWh) between industrial and 'other' (services, residential, and agriculture) had a ratio of 1: 6, andwas based on the presentation by Roussouw (2010). Based on the CCS (IPA, 2007) report, the cost of transmission, industrial and 'other' was $ 40.66, $ 40.66 and $243.94 per kWyr respectively. With the focus of investigating the effects of a dry year on the electricity system and how the system can be made more resilient to climatic uncertainty, two climatic scenarios, Average and Dry Year, were considered for both Base-case and High Growth economic projections. However, system diversification strategies, with and without a diversification policy, were only developed for the High Growth scenario. The Average Year scenario assumed that throughout the analysis period, the river flow was normal, with varying costs of import electricity and fossil fuel. Electricity trade was limited to 355 and 195 GWh for exports and imports respectively. This scenario offers least cost development option for the electricity system for both economic scenarios. In the Dry Year scenario, however, it was assumed the all hydro except the mini-hydro plants were affected by a dry year. The dry year was from 2016 to 2030. This scenario was developed to explore the impacts that reduced river flow could have on the system. The electricity system was analysed with and without a diversification policy. A scenario of increasing importation of 22.2 MW to 2 060 MW during a dry year was also explored. A total of five sensitivity tests were applied to systems with and without a diversification policy to check the sensitivity of the optimal solution. 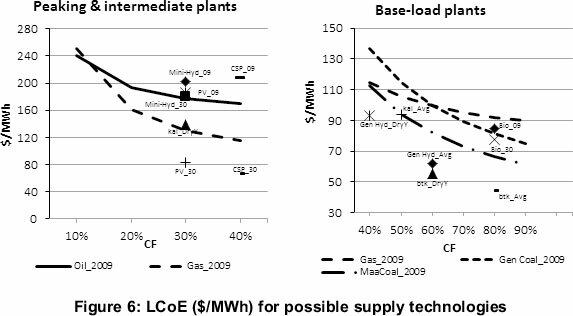 The sensitivity parameters that were adjusted are discount rates (6% & 14%), carbon price ($ 25 & $ 50 per tonne) and pessimistic learning for RE technologies. There is uncertainty of how electricity demand will evolve as shown in Figure 5. Zambia could on one hand experience critical shortage if the electricity system is designed for Base-case scenario only for the economy to follow a High Growth scenario, while on the other hand, there could be excess in power supply if the system is developed for high growth only for the economy to take a base-case path. Thus, creating a feedback link between economic and energy systems would be critical in aiding decision making and for developing a robust and flexible electricity system. In both economic scenarios, the industrial and residential sectors continue to dominate electricity demand. The share of industrial sector consumption continues to increase in the Base-case scenario, accounting for about 64% of total final electricity, while because of an aggressive electrification policy in the High Growth scenario, the share of residential sector increases significantly from 28% (2008) to 31% (2030) but industrial sector's share is reduced to 58%. 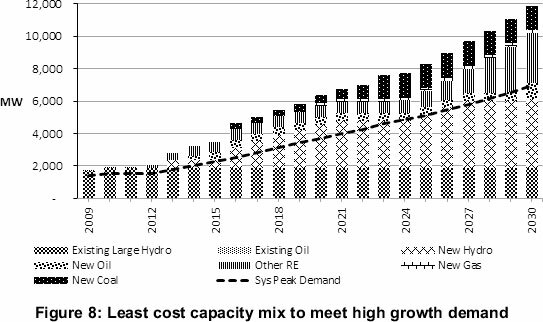 Even with technology learning on RE technologies, hydro technology continues to be a cheaper supply option, both in the Average and Dry Year scenarios, as shown in Figure 6. 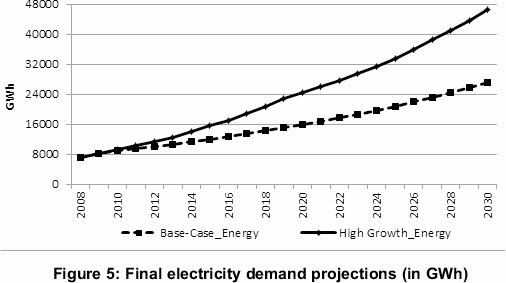 In order to meet electricity demand in the Base-case and High Growth scenarios, the system has to be expanded from 1 719 MW (2009) to 5 961 MW and 11 923 MW by 2030 respectively as shown in Figures 7 and 8. The systems built in this scenario also represent the least cost capacity development. The required total investment capital cost for base- case system is $9.8 million, while $23.8 million would be required for high growth system. 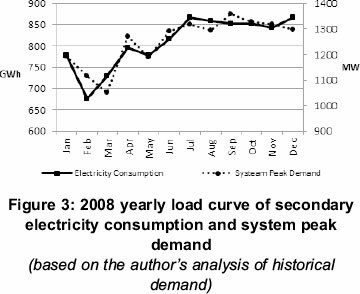 It should be noted that the System Peak Demand (solid line) projections was based on the served electricity demand and base year load profile. Capacity development in both cases is dominated by hydropower as anticipated from the LCoE analysis (see Figure 6). However, in the High Growth scenario, the share of large hydropower capacity drops from 98% (2009) to 52% (2030). 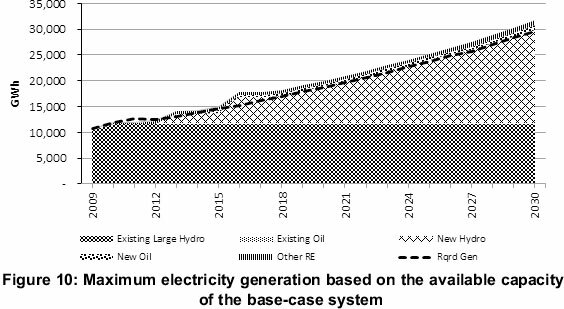 The base-case system is still highly dominated by hydropower in 2030 (91%). Gas and oil plants come online to serve as peaking plants, while RE capacity is built mainly to meet growing demand from 2012 to 2016, since it is the only supply option available. 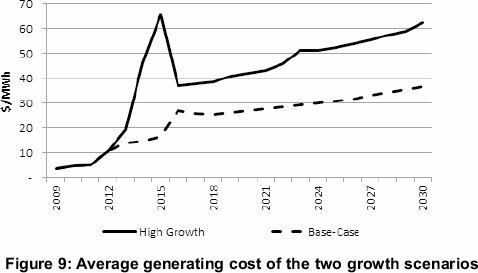 The average generating cost in both systems increase sharply from 2012 to 2016 as shown in Figure 9. This is mainly because of the increased capital investment into the system and increased operations of oil plants. The maximum electricity that can be generated by both systems is shown in Figures 10 and 11. The solid lines indicate the electricity demand at secondary level. The share of electricity generation, based on the available capacity (excluding imports), from large hydropower technologies reduces from 99% (2009) to 94% for base-case system, and 49% for high growth system by 2030. Figure 12 shows the Reserve on Energy (RoE) for the system developed with a reserve margin (RM) of 15% for both economic scenarios. It can be observed that the high growth system has a higher RoE than base-case system. This is because 'Other' demand for high growth system experienced a higher growth over Industrial demand, which led to building more capacity to meet peak loads. 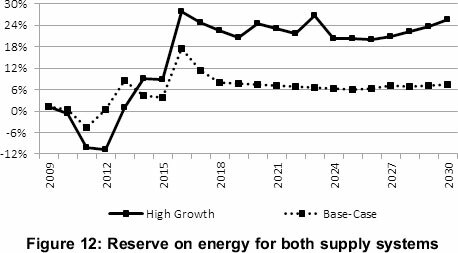 From Figure 12, it can also be deduced that both systems will experience energy shortages until after 2012. The diversification policy was explored for a high growth system in a Dry Year scenario. 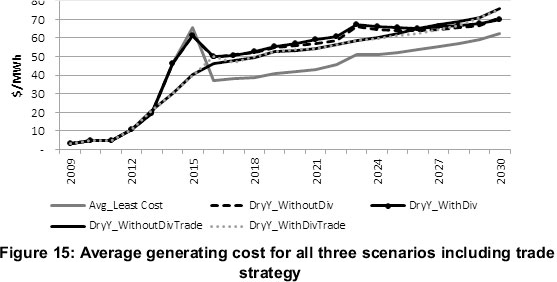 The evolution of the electricity system in the Dry Year scenario is as shown in Figure 13. The system without a diversification policy (DryY_WithoutDiv) will require additional capacity of RE, gas and coal technologies, while deliberate diversification of the system could lead to delay in development of hydropower, gas and oil technologies in preference to development of coal and RE technologies. Relative to the system in an Average Year scenario, the system with a diversification policy (DryY_ WithDiv) would require an additional investment capital cost of $3.7 million, while the system without the policy would only require $2.6 million. Further, the additional capacity shown in Figure 13 is what needs to be built in order to improve the adaptive capacity of the system, both with and without a diversification policy. Although there are higher costs (capital investment and fixed Operation and Maintenance) in a system with a diversification policy, there is a small difference in the average generating cost between two systems as shown in Figure 14. There is also a minimal difference in CO2 emissions, 1 416 kton and 1 473 kton for the system without and with a diversification policy respectively. Further, diversification policy requires a more aggressive approach to investing in RE technologies. Therefore, if Zambia opts to diversify the electricity system, additional policies and institutional frameworks that are required for the development of RE technologies have to be in place. 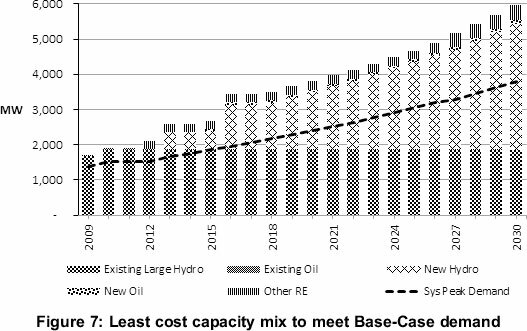 The sharp increase in the average generating cost in 2014 and 2015 could be reduced significantly by importing electricity from the regional market as shown in Figure 15. Importing electricity would also reduce the need for capital investment and delay the need for oil, gas and some coal plants. Nonetheless, trade strategy is dependent on the availability of electricity on the market. Electricity imports offer a cheaper option for mitigating impacts of a dry year but increasing imports may in the long run lead to energy insecurity and expose the country to price shocks. This paper has outlined a methodology that captures the essential aspects of electricity demand in a developing country. Different scenarios were developed to explore how electricity demand could evolve in the future. Two climatic scenarios were developed in order to investigate the impact that a dry year could have on the Zambia's electricity system. Strategies that would be implemented to mitigate the impacts of dry year were also explored. Residential sector demand is influenced more by the rate of electrification than the increase in HH income. The industrial sector continues to dominate electricity demand in Zambia, regardless of the economic scenario. Hydropower remains a cost effective option of supplying electricity in Zambia, both Average and Dry Year scenarios. Zambia's electricity system (with or without a diversification policy) is vulnerable to dry years because of the significant share of large hydropower plants already in the system. Thus, the impact of a dry year on the average generating cost is significant. The average generating cost for the system without a diversification policy increases by an average of 18.2%, while for a system with a diversification policy, the generating cost increases by 19.5% relative to the least cost system in average year scenario. However, increase in imports would considerably reduce the cost of generating electricity during dry years, by an average of 12.1% and 11.8% for the system without and with a diversification policy respectively. A discount rate of 6% favours early development of solar PV but delays investment in solar CSP and bio technologies, while a rate of 14% favours bio technology but delays capacity development of solar PV, solar CSP and coal technologies. A carbon price of $50 per tonne has negligible impact on the development of carbon emitting technologies making coal a viable option for base-load provision at those CO2 price levels. Pessimistic technology learning rate favours investment into solar CSP and bio technologies but it delays investments into solar PV. The impact of a lower rate in reduction on the average generating cost is however minimal. The authors would like to thank the Energy Research Centre UCT, UNITAR, CKDN and the Dutkiewicz Family Trust for their financial support.